The Train Like a Martian program challenges kids to participate in daily physical activities, just like a NASA astronaut would. Space is harsh on the human body, especially when astronauts go to extremes, such as spending months on the International Space Station — or taking a future trip to Mars. "Regional events are being planned in Huntsville, Alabama; Minneapolis; and central Florida on April 24, the same day astronaut Tim Peake will run the London Marathon on the International Space Station," the statement said. Besides the reward of participating, the challenge encourages people to fundraise to support The Mars Generation, and to raise awareness of the program through social media and by other means. Prizes will be available for both participation and fundraising. "The challenge is helping bring awareness to the importance of health and fitness to a balanced life," the group wrote on its website. "While STEM [science, technology, engineering and math] education is our focus at TMG, it is also important to encourage and educate people about healthy living." "The Train Like a Martian challenge will also be an opportunity for individuals and groups to fundraise in support of the mission of The Mars Generation, including all our outreach programs, our student space ambassador program and space camp scholarship program," the website said. The Mars Generation is a nonprofit organization founded by Abigail Harrison, a teenager who informally assisted Italian astronaut Luca Parmitano with outreach for his space station mission in 2013. The advisory board includes several former astronauts and Robert Pearlman, managing editor of collectSPACE.com and a Space.com contributor. 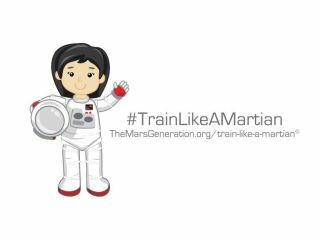 You can learn more about the Train Like a Martian challenge at the project's website: http://themarsgeneration.org/train-like-a-martian/.